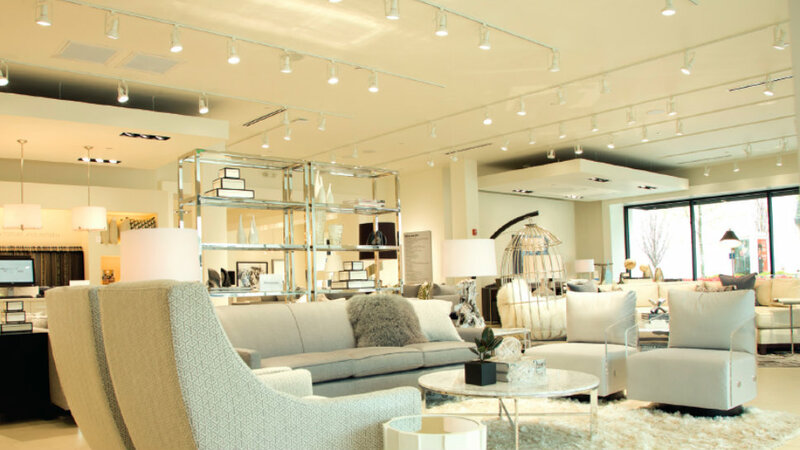 The Mitchell Gold + Bob Williams Signature Store is located at 15 Oakbrook Center in Oak Brook, 630-288-7020, mgbwhome.com. When Mitchell Gold and Bob Williams opened their furniture company 27 years ago, they made sure their product line was eco-friendly. As avid environmentalists, Gold and Williams are conscious of how their furniture production impacts the planet. This same approach has now been applied to the latest addition to Mitchell Gold + Bob Williams’s design program—a luxury fall drapery collection, complete with a mix of fabrics, colors, styles, hardware, top treatments, accessories, and more. “It’s a new drapery program that we’ve coordinated to go with our living room, bedroom, and dining collections,” says Bob Williams, co-founder and president of design. “We designed it so you can pick your own style of treatment—whether you want a pattern, solid, or vertical or horizontal color blocking.” Williams hopes customers can create something unique by choosing from the varying materials to mix and match. The window program offers seven different fabric collections including heavy weight Belgian linen, velvets, semi-sheer linens, a textured weave, and two graphic patterns. Each collection caters to customers’ specific tastes and styles. For example, the Belgian collection features eco-friendly natural linen from Belgium while the Avignon collection offers American-made velvets for a traditional and modern look. There’s also the semi-sheer linens of the Kinglsey Collection and the neutral-toned, woven textures of the Legacy Collections. The Savannah and Spencer Collections offer pattern, yet each is unique in its own modern design. Melissa Hernandez was an integral part of creating the new drapery line and she couldn’t be more excited for people to see the “jewelry for the windows,” as she likes to say. “She’s the one who really helped put together the whole drapery program,” says Williams. The high-end, decorative, designer-trade hardware, finials, rods and accessories complement each drapery choice and are functional parts of the window program. “We offer five different top treatments,” says Williams. “We offer everything from a rod pocket to a grommet to a single pleat to a much more traditional double pleat. We even have a more fashionable European pleat.” And no matter which top treatment you choose, it all costs the same. The hardware comes in three finishes—polished chrome, brass, and black nickel. “Our hardware is stocked here and ready to ship,” says Hernandez. The finials are offered in a variety of styles including Cap and Ball for the metal finial and Cylinder, Faceted, and Modern Knob for the metal and acrylic kind. This post was sponsored by The Mitchell Gold + Bob Williams Signature Store. The store is located at 15 Oakbrook Center in Oak Brook, 630-288-7020, mgbwhome.com. Mitchell Gold really knows how to work with wood. I am sure it gets very hard.